Helicopters are a large part of Alberta’s defense against raging wildfires. In Bob Petite's latest book he discusses and documents the history of Forest Service aviation operations in Alberta dating back to the early 1900's. Protecting Alberta’s forests has been a vital consideration, even from 1905 - when Alberta became a Province. Bob began his 40 plus career with the Department of Lands and Forests in Nova Scotia, then with the Forest Service in Alberta. Beginning in the 1920's, fixed-wing aircraft were employed with some success. But the years following the end of WWII saw the helicopter open up new ways of quickly and accurately inserting firefighting crews and equipment into the timbered lands that comprise such a valuable part of the province's assets and economy. Helicopters were first used in firefighting in 1956; in 1957 the Department of Lands and Forests purchased its first helicopter, a Helio Courier, followed by the Bell Model 47J in 1958. This all began Alberta Forest Service's fleet for forest fire management. The new book tells the story of not only those successes, but of the people, places, agencies and new technologies to fight wildfires that were also involved over the following decades. 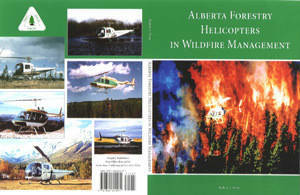 Order your copy today to learn more about Alberta's helicopter history!